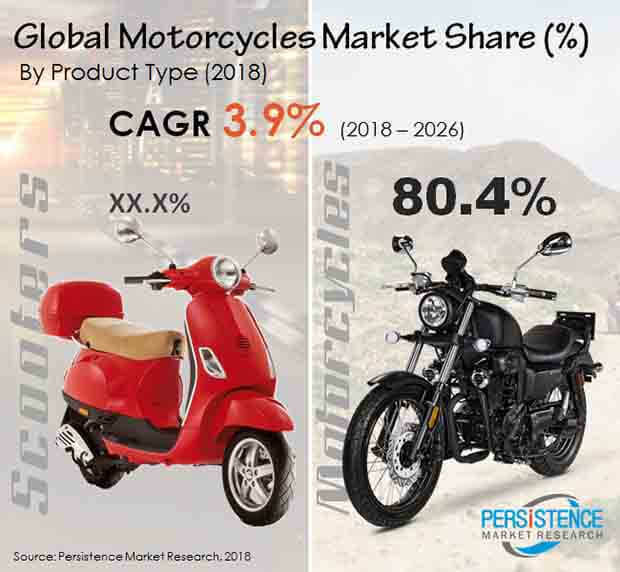 Persistence Market Research (PMR) analyzes the motorcycles market in its new publication titled “Motorcycles Market Global Industry Analysis 2013 – 2017 and Forecast, 2018 – 2026”. This study provides data for 2017 along with the forecast for the period 2018 – 2026. The main objective of the report is to identify the dynamics of the market and provide recent updates and insights that affect various segments of the global motorcycles market. To provide a better understanding of the motorcycles market, the report also includes analysis of global drivers, restraints and trends, which influence the current market scenario and future status of the global motorcycles market over the forecast period. To understand and assess market opportunities and trends, the global motorcycles market report is categorically split into different sections based on market segmentation – by product type, technology and region. The report starts with an overview of the motorcycles market and provides market definition & taxonomy, along with the value chain, pricing analysis, drivers, restraints and trends in the market. The sections that follow include the global motorcycles market analysis by product type, technology and region. All the above sections evaluate the motorcycles market on the basis of various factors affecting the market. Each section discusses the qualitative and quantitative aspects of the global motorcycles market. To give a brief idea about revenue opportunities by product type, technology and region segments, the report also provides the value of the motorcycles market, absolute $ opportunity and total incremental opportunity for each segment over the forecast period (2018 – 2026). In the final section of the report, we have provided the global motorcycles market structure and a detailed competition landscape with the company market share and performance to provide a dashboard view of key players operating in the global market along with their business strategies to report audiences. This is expected to enable clients in assessing strategies deployed by market leaders and helping them develop effective strategies accordingly. For market data analysis, we have considered 2017 as the base year, with market numbers estimated for 2018 and forecasts for 2018 – 2026. To calculate the market size, the report considers the weighted average price of motorcycles based on the product type, such as motorcycles and scooters, across key geographies on a country basis. The forecast assesses the total revenue (US$ Mn) and volume (‘000 Units) of the global motorcycles market. To deduce the market value, the cost of each motorcycle and scooter by product type has been considered. In order to provide an accurate forecast, we have started by sizing up the current market, which forms the basis of how the global motorcycles market is expected to develop in the future. Critical market data, including the base number and segment splits, has been devised through in-depth secondary and primary research. This data is then triangulated on the basis of different verticals by considering supply side as well as demand side drivers and other dynamics of various regional markets, along with primary interviews of manufacturers and industry experts operating in the global motorcycles market. The forecast presented in the report evaluates the actual cost of different types of motorcycles and the cost as per brands in the global motorcycles market over the forecast period. We have also analyzed different segments of the global motorcycles market in terms of Basis Point Share (BPS) to understand the relative contribution of individual segments to market growth. This detailed level of information is important for identifying various key trends governing the global motorcycles market. The report also analyzes the global motorcycles market based on the absolute dollar opportunity, which is usually overlooked while estimating the market forecast. However, from a sales perspective, it is essential to identify the absolute dollar opportunity to identify potential resources in the motorcycles market. PMR has developed a market attractiveness index to understand the key segments in terms of their performance and growth in the global motorcycles market. This market attractiveness index is expected to help clients identify real market opportunities in the global motorcycles market. A motorcycle is a two-wheeled vehicle, primarily driven by an Internal Combustion Engine. Motorcycles are also known as motorbikes or bikes and nowadays, consumers are also opting for electric motorcycles. Motorcycles are built with strong metallic and fiber frames integrated with many mechanical and electronic components along with an engine. Scooters are also two-wheeler vehicles driven by Internal Combustion Engines, but they’re built differently from conventional motorcycles. They have metallic or fiber bodies, consisting of a footboard on which riders rest their feet. Some examples of scooters include Piaggio Vespa, TVS Jupiter and Aprilla SRV 850. The global motorcycles market is estimated to be valued at US$ 115,720.5 Mn by the end of 2018 and reach US$ 156,903.0 Mn by the end of 2026, with a CAGR of 3.9% over the forecast period. The global motorcycles market is anticipated to represent an incremental opportunity of US$ 41,182.58 Mn between 2018 and 2026. The demand for motorcycles is directly driven by the increasing middle class population across the globe, which in turn is surging the demand for affordable means of transport, such as motorcycles and scooters. Manufacturers are focusing on manufacturing conventional motorcycles with a sportier look featuring air cooled engines as these types of engines are popular among younger riders and consumers in general. People prefer these motorcycles as they are equipped with larger displacement engines and provide good fuel efficiency as compared to smaller displacement engines. Economy segment motorcycles have maintained their prominence in the motorcycle market. Improvements in mileage and other advantages such as larger fuel tanks, low cost of maintenance and longevity are responsible for the preference of these motorcycles over scooters. All such features are expected to further increase the demand of motorcycles and scooters, thereby creating opportunities for the augmentation of the market in the near future. The global motorcycles market can be segmented on the basis of product type, vehicle type, technology and region. On the basis of product type, the global motorcycles market can be segmented into motorcycles and scooters. On the other hand, the market can be segmented on the basis of motorcycle type into standard, cruiser, sports, mopeds, electric and others. While on the basis of scooter type, the market can be further segmented into standard, maxi, enclosed, three-wheeled and electric. Significant regions covered in the report include North America, Latin America, Europe, South East Asia & Pacific, India, China, ASEAN and the Middle East & Africa. The motorcycle segment is projected to account for a 67.1% volume share in the global motorcycles market by the end of 2026 with a CAGR of 3.6% over the forecast period. By technology, the electric segment is expected to grow with a significant rate over the forecast period. The segment is expected to grow with a volume CAGR of 4.9% during the forecast period. From a regional perspective, India is estimated to represent 37.9% of the market volume share in 2018 with an anticipated volume CAGR of 4.2% over the forecast period. The sales revenue of motorcycles in India is expected to reach US$ 57,819.3 Mn by the end of 2026 with a CAGR of 4.3% over the forecast period. Market growth in ASEAN countries is expected to remain high as compared to the global average between 2018 and 2026. Some of the key market participants reported in this study of the global motorcycles market include Bajaj Auto Ltd., Bayerische Motoren Werke (BMW) AG, Ducati Motor Holding S.p.A., Eicher Motors Limited, Harley-Davidson, Inc., Hero MotoCorp Ltd., Honda Motor Co., Ltd., KTM AG, Piaggio & C. SpA, Suzuki Motor Corporation, Triumph Motorcycles Ltd., TVS Motor Company Ltd., Vmoto Limited, Yamaha Motors Co., Ltd. and Zero Motorcycles, Inc.